Wireless charging is becoming an ever more popular way to juice up consumer gadgets, but an international team of scientists may have figured out how to scrap the mat too. Research by the Moscow Institute of Physics and Technology offers a way to wirelessly transfer power consistently over longer distances than conventional methods. At present, wireless charging makes use of electromagnetic fields generated by induction coils that start working as soon as a supported device (such as a phone) comes into range. The issue is that "in range" means "touching" and the strength of the field is inversely proportional to the distance between coils. An alternative approach is far-field energy transfer, which requires two antennas, one sending electromagnetic waves to the other. The receiving antenna then converts this radiation into electric currents. Boffins have often proposed the approach as a way of transferring solar power from orbiting satellites to Earth. Difficulties with the size of the ground-based receiver and practicalities of the conversion process have led the likes of Elon "say what you mean" Musk to react somewhat negatively to the idea. "Stab that bloody thing in the heart," he said. A more practical use for far-field energy transmission is to allow charging without requiring proximity (for example, not having to remove a phone from a jacket pocket to charge it). The problem lies with the receiving antenna sending some of the radiation back into the surrounding environment (Ʈf in the diagram). When the coupling constant of Ʈf and the coupling constant of the radiation transmitting to the connected circuit (Ʈw in the diagram) are balanced, the energy transfer to the circuit is maximised. Sw- is how much energy is actually going into the circuit. Sf is incident radiation, which re-radiates back into the environment. However, obstructions or movements of the receiving device can result in the power received dropping substantially. The antennas can be tuned to transfer energy with almost no loss of electrical power. However, as soon as the environment changes (an obstruction or a movement of the antenna), the amount of energy transferred drops off sharply as the coupling constant becomes unbalanced. 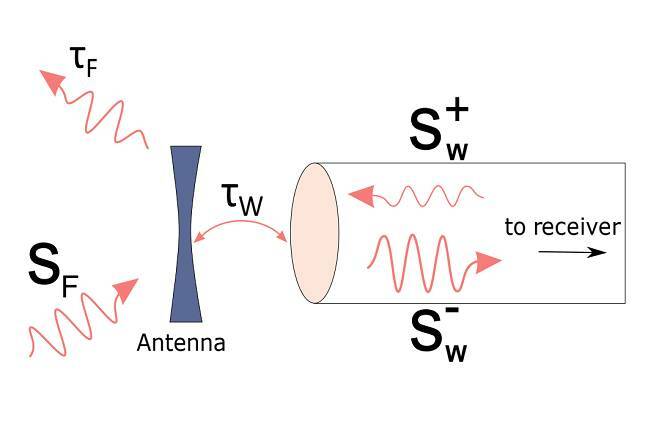 The approach of the team is to use the normally passive receiving antenna to send a signal with a particular phase and amplitude (Sw+ in the diagram) to enhance the wave transmission through interference. This brings the coupling constant back into balance. Boffins reckon this auxiliary signal could be set automatically by a feedback loop. To prove the theory, the team set up transmitting and receiving antennas 40cm apart and showed that even with a large mismatch in the coupling constant, the system was able to get back to the equivalent of a tuned power transfer. While innovative, the technology has yet to impress. Morris Kesley, CTO of Witricity, told Physics: "There are other approaches for adjusting the [mismatch] on the device side to achieve better efficiency or increase received power, and I'm not yet convinced that it would be worthwhile trying to implement [this one]." Other researchers have proposed scavenging energy from sources such as Wi-Fi networks to get a charge into devices. The researchers themselves remain undeterred, concluding that "coherent signals sent from the receiving port of a WPT [wireless power transfer] system can largely enhance and control the power transfer efficiency".